1. Clean the mussels, washing them really well, scrubbing off any barnacles and removing any ‘beards’. Tap each one on the side of the sink. If it doesn’t close when you tap it, throw it away. 2. 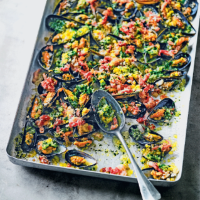 Put the mussels in a large saucepan with the wine or water, onion and the finely chopped stalks from the parsley. Cover and steam over a medium-low heat for 4 minutes, shaking the pan every so often until the mussels have opened. Leave them to cool, then drain. Throw away any mussels that haven’t opened. With the others, leave the mussels on their half shells and discard the other half shells. 3. Sauté the bacon in its own fat in a frying pan for 3 minutes. You just need a little colour, not to cook it all the way through. 4. Preheat the oven to 190°C, gas mark 5. Mix together the butter, garlic, shallots, 2 tbsp of finely chopped parsley leaves and thyme. Spread a little of this on each mussel and put in a single layer in 1-2 large gratin dishes. Add the bacon and scatter on the breadcrumbs and remaining parsley. Bake in the oven for 10 minutes, until golden and serve immediately. This recipe was first published in Thu Mar 22 09:44:00 GMT 2018.